Sonos is the king of wifi multiroom audio, but if anybody can give it a run it’s Bose, the storied manufacturer of sometimes very good sound gear that people can’t get enough of. This new $200 entry to its SoundTouch wireless line could be the key to winning over your home. Two years ago, Bose entered the multiroom wireless audio fray with a system characterized by its simplicity. SoundTouch didn’t have a lot of streaming music services thenand it’s still pretty simple today. SoundTouch is still centered around a system of six presets. These presets can be radio stations on Pandora or playlists in your personal collection. You access them either from a bare bones interface in Bose’s SoundTouch app, or your can just walk up to a speakers and push one of the numbered buttons on top. This week, the SoundTouch system is getting an overhaul both in terms of functionality and hardware. First of all, meet the SoundTouch 10, a wifi-connected speaker that also has Bluetooth. So if you want to play music from one device on your speaker, you can do it on the fly. But if you want to use the SoundTouch’s multispeaker wifi-based features you can do that as well. 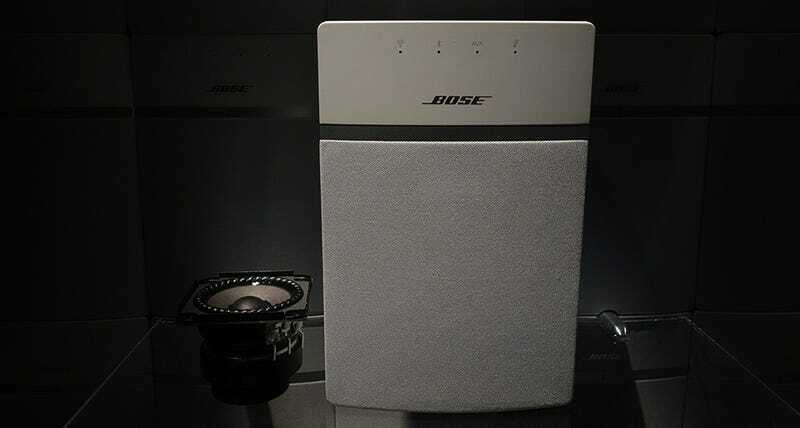 Additionally, Bose is refreshing the more expensive SoundTouch 20 and SoundTouch 30 with built-in Bluetooth as well. This isn’t surprising. SoundTouch hasn’t quite caught on universally, but the company’s Bluetooth-only SoundLink speakers have done very well. And though I don’t want to overstate the competition, the launch of Bluetooth, and the new $200 speaker should be seen as aimed directly at cutting into Sonos’ market share. The entry-level $200 price point is the exact same price as Sonos’s very popular Play:1 speaker. What’s more, Sonos has stubbornly refused to add Bluetooth to any of its products. It’s a little added perk that might be appealing. Will it work? Well, not if Bose doesn’t beef up its overall system a little bit. Sonos connects to virtually any streaming music service natively (except Apple Music, which is coming soon). Additionally, the company is working on new functionality that allows deeper integration with Spotify, so that you can control the multiroom/multispeaker features of SoundTouch from directly inside the app. This taps into the Spotify Connect wireless speaker powers the streaming service launched a few years ago. That implementation should be ready to go “early next year,” according to both Bose and Spotify. One other feature that’s absent from Bose’s SoundTouch is the ability to combine two speakers into a stereo pair, as you can do with most other wifi systems, and even some Bluetooth speakers. We’re told this feature will also be ready in the new year. So I only listened to the new SoundTouch 10 for a hot second in terrible conditions, and it wouldn’t be fair to characterize the sound from that experience. One thing I can say is that Bose certainly didn’t design a beautiful speaker. Its boxy design looks pretty frumpy compared to some of the rounder lines you see on other products from Sonos, yes, but also Bluetooth competitors like the UE Boom. One thing’s for certain—bundling wifi and Bluetooth into a $200 speaker from a reputable brand seems like a pretty good deal, even if Bose is still playing catch up. The SoundTouch 10 is available for purchase now. When we have a chance to check it out in more detail, we’ll let you know what’s good.